Ushuaia across from the port. beautiful hostel in a good location. BsAs...and for an excellent price! wineries where I took a tour. place I found while walking around. baths smack-dab in the Andes. High tea at the Alvear Palace Hotel. 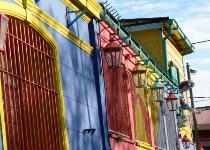 drinking and shopping in Buenos Aires. Best Moment: Really hard to say. Iguazu Falls was incredible. 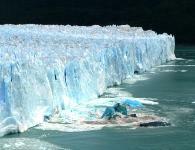 So was the Perito Moreno glacier. But does it really get better than shopping your you-know-what off for the first time in over a year??? Bingo! I came away with a bottle of vino tinto. 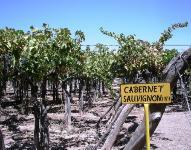 Smells: Whiffs of chocolate upon entering shops and cafes in Patagonia; wines in Mendoza. dogs yapping away in the parks and on the sides of streets. Juniors 'football' game (200 pesos); horses races at the Hippodrome; Casa Rosada and Plaza de Mayo. the best smoked salmon sandwich of my life. leather jacket; five dresses; a shawl; some earrings, necklace and a ring; strappy shoes; a visor. Street Food: Empanadas; sweets like alfajores, 'mate'. Western Companies Out Here: McDonald's; Burger King; Curves; Tiffany; Blockbuster. Type of currency? Argentinian Peso. $1 US is equivalent to about 3 pesos. The amazing Perito Moreno glacier. In Caminito in Buenos Aires.